How Can I Maximize My Benefits to Afford Dental Implants? Okay—your dental insurance probably doesn’t cover the cost of dental implants or their placement. So what can your benefits be used for considering the other steps involved in having implant supported teeth replacements? After administering a local anesthetic, the dentist makes an incision in your gum to reveal the bone underneath. A small section is removed and the implant is surgically positioned. Your gum tissue is stitched closed and healing begins. Underneath the gums, the implanted post and surrounding bone tissue integrate to form a stable anchor for your new tooth. In a few months, you’ll return to your dentist to have the appropriate restoration attached. If you would like assistance figuring out the best way to use your dental insurance benefits for dental implants, please call a dentist in Millburn for assistance. Dr. Robert Shick rebuilds failing smiles with high-quality dental implants. His commitment to excellence gives patients healthy and attractive smiles along with a renewed sense of confidence. 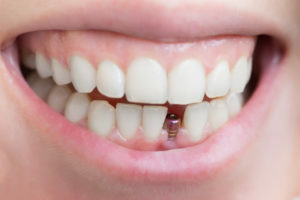 To discuss with Dr. Shick whether dental implants are the right tooth replacement option for you, visit his website today or call the office at 973-671-1841.